FINAL SALE. This stunningly shimmering dress has a simple cut with beautiful details! The Glitzy Web Textured Overlay Dress comes in two great colors and features a simple sleeveless shift dress shape with an awesome sparkling web-like overlay. This is a unique style you’ll love to wear and be the center of attention! The intricate overlay fabric looks like a shiny see-through web with tiny sequins throughout—this would be the perfect dress for any holiday cocktail party or for New Year’s if you like to plan ahead. 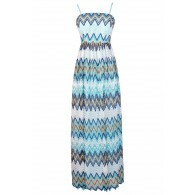 It has an invisible side zipper and would look great with some strappy heels and a clutch. Also available in Silver Cream. 55% cotton, 45% polyester. Lining: 100% polyester. Hand wash cold water separately. No bleach. Hang to dry. Small measurements: Length from top of shoulder to hemline: 32”. Overlay is longer than underlining and measures 36”. Bust: 32-35”. You have added Glitzy Web Textured Overlay Dress in Grey into Wishlist. You have added Glitzy Web Textured Overlay Dress in Grey for Stock Notification. You have set Glitzy Web Textured Overlay Dress in Grey as a loved product. 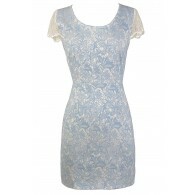 You have removed Glitzy Web Textured Overlay Dress in Grey as a loved product.